There have been more than a few events in the past 20 years or so that, even as I accepted their possibility, sent chills down my spine upon learning they actually happened. This sensation of primal fear tended only to grow stronger with time to ponder the deeper significance of such events upon the direction of the nation, a nation in which I now raise a young child. One was the Supreme Court’s still unfathomable decision to appoint George W. Bush president in 2000. Another was the same Bush’s decision to eviscerate a virtually defenseless Iraq under the pretense of somehow making it into a democracy. A third was the passing of the National Defense Authorization Act (NDAA) that permits the military to seize U.S. citizens, strip them of due process and hold them indefinitely in military facilities under the pretense of fighting terrorism. Add to these now the decision in Vergara vs. California, which may seem small potatoes when compared with the above, but, unless things change in this country and radically so, I fear it is anything but. The case, we are meant to believe, was brought forth by nine preternaturally litigious kids who just grew tired of being the victims of “grossly ineffective teachers” who, protected by California’s laws on tenure and seniority, robbed them of their civil rights to a fair and adequate free public education. 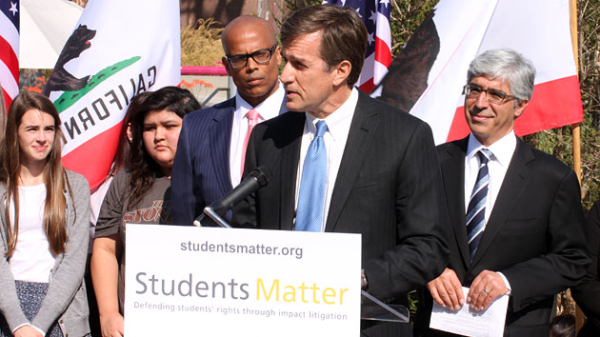 Somehow, the kids’ cause came to the attention of Silicon Valley technology entrepreneur and modern day civil rights leader David Welch, co-founder of Infinera and founder of the advocate group StudentsMatter, and David being David… well, he just had to act. Welch, out of the kindness of his massive heart, massively bankrolled the civil rights lawsuit, hiring none other than the “high-powered legal team chaired by famed litigators Theodore Boutrous and Theodore Olson, ” the same legal team, in fact, that brought us George W. Bush in the 2000 presidential election. The solution to this alleged civil rights case, concluded Judge Rolf Treu, is not to extend probation or hire better administrators or anything sensible and moderate like that. No. The solution, declared Treu, is to gut all job protections for all teachers across the state of California; and, if Boutrous and Olsen and their mega rich employers are to be believed, across the country – just like the Common Core. Or so goes the dark Disneyland narrative. It is many things and none of them good. All of them are portents of a bleak and miserable future for 99 % of Americans. Has there ever been a legal profession that has undergone the barrage of insults and insinuations and insane claims ( education is now a threat to national security) from every conceivable form of media—documentary, newspapers, Hollywood film TV, and radio — as have teachers in the past decade or so? If so, who? When ? Neither Duncan nor anyone else on planet earth can explain how stripping teachers of due process (tenure) and the dignity and liberty that goes with it can, in any way, shape or form, help students be taught by a “great teacher,” but what the hey. Duncan, as shameless as ever, did doubtless please his masters with his straight face declaration that the lawsuit was, in fact, brought by children and not yet another saintly billionaire using children to ram into place their stealth agenda. Some times one has no words. It is ample evidence of the dark genius of the 1% who have figured out how to manipulate or purchase the institutions and mechanisms created to insure a modicum of democracy and justice – namely, elections and the courts – and use them to destroy democracy and justice. It is also ample evidence of the moral bankruptcy of the “reformers,” who will use anything, even children as innocent class warriors, to get their way in their stealth class war. Most egregiously, insofar as the “reformers” have hijacked the language and iconography of civil rights, the most emotionally resonant, heroic and spiritually charged movement in American history, the Vergara decision is, to my way of thinking, outright blasphemy. But not merely blasphemy: Vergara is blasphemy wrapped in perversity, sugar coated in obscenity. The blasphemy is using the sacred spirit of civil rights for the venal cause of union busting under the shameless pretence of helping kids. The perversity is the insinuation that magically appearing billionaires who never taught a day in their lives care more about the fate of the urban poor than the teachers who serve them day in and day out. The obscenity is the political obsequiousness that fortunes that no sane society would even allow, never mind genuflect before, are allowed to dismantle the institutions — unions and public education – that built America, and are doing it in the name of freedom. But it is a grave mistake to perceive the Vergara decision as simply another attack, however brutal, on teachers and education. Education is merely the conduit. Vergara is an attack on the rights of every worker in the USA, union or not. The 1% may know little of history, but they know enough about the union movement to know that, in time, the force that revolutionized even non- union industries, forcing them to treat their workers with dignity, pay them fairer wages and provide them with some modicum of security, was the threat of unions. They also know the absence of unions has exactly the opposite effect. Consider the working conditions of most Americans in the land of the free and the home of the brave since the shrinkage of American unions. No due process. No job security. No pension. No nothing but a wage that for most people has not grown since 1973. It is in this light that the Vergara decision need be seen: as yet another objective indication of a new, if yet to be fully formed, oligarchic despotism where most of us are to live as obsequiously as valets before our rapacious and one dimensional overlords, grateful to have jobs of any kind, more grateful still for their philanthropic gestures. understand that the overlords running their lives, those who have bankrolled and orchestrated decisions such as this, could not care less if they or their children lived or if they died, it will inevitably result in barbaric physical violence. In the immediate future, what Vergara is about is wrecking the teachers’ unions, the faster to privatize the public school system and all of public life so as to create a revenue stream that will continue the greatest transfer of wealth upwards in human history. In the long term, it’s about eviscerating union consciences altogether so that in a generation or so, solidarity among workers (or anyone for that matter) will seem as distant and romantic as the moon, a process already well under way. It is also about the insanely rich using the trappings of democracy to hollow out democracy, to insure that “government of the people by the people and for the people” does indeed perish from this earth. Five months have passed since Carmen Farina assumed the role of Chancellor of the NYC Department of Education following 12 years of the sadistic reign of Michael R. Bloomberg. And while, unlike her three predecessors, Farina is indeed an educator, little at Tweed, other than the tone and rhetoric, has really changed. The institutions and the policies remain eerily similar to that of Walcott and Klein. To wit: Tweed remains bulging with lawyers charged with advising principals how best to fire tenured teachers. The loathed and exorbitantly expensive networks are still running around pretending that they are actually working and actually know what they’re doing. Sociopathic principals are still ruining the careers of new teachers without a second thought, while the cases of hundreds of unfairly U rated or discontinued teachers remain wholly unexamined. The Leadership Academy continues to churn out new “business model” principals by the sackful. And the newly ratified UFT contract goes near none of this. 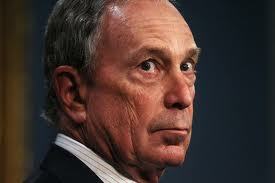 In many ways, teachers are struggling through what can rightfully be called Bloomberg’s fourth term. All those who can attend should attend. Nothing will change until we make it change and we have no one to depend on but ourselves. Brought to you by Bill Gates, Whitney Tilson, DFER , and other super rich lovers of poor American children. Do you have the ability to lie through your teeth without an inkling of remorse ? Are you immoral enough to labor to undo and undermine the hard earned rights of teachers under the guise of somehow helping them to become better at a job you know nothing about? Are you shameless enough to parrot the absurd fantasy that E4E was “founded in spring 2010 by two Bronx elementary school teachers “ who then just happened to receive instantaneous and total access to the highest echelons of the world of education, endlessly fawning press and, within a year or two, a multi million dollar budget and offices in several major American cities all because their message is so compelling to teachers? Are you mercenary enough to manipulate the fears and naiveté of young teachers without ever revealing who and what you are really working for? Are you willing to sell your very soul deforming language and reality to assist in the destruction of one of the most vital institutions of the remains of American democracy? If the answer to all of these questions is affirmative, then you may well have a luminous future as Director of Communications of Educators 4 Excellence — at least until Bill and Whitney and their pals pull the plug on this elaborate con job at which point it will vanish instantly into thin air. But for now “ Educators 4 Excellence is entering an expansion phase as it seeks to provide a platform for teachers across the country to elevate their voices.” So, better strike while the money is still rolling in and the ruse is still being bankrolled. Make sure you watch the video, “This Is Who We Are,” found at the end of the link which features cameos from a couple of ed reform superstars including the epitome of shilldom, former NYC Chancellor of Education Dennis Walcott. For far too long, education policy has been created without a critical voice at the table: the voice of classroom teachers. Founded in spring 2010 by two Bronx elementary school teachers, Educators 4 Excellence (E4E) is changing this dynamic by placing the voices of teachers at the forefront of the conversations that shape our classrooms and careers. Take Action by advocating for teacher-created policy recommendations through E4E’s teacher leadership training programs. In just a few years, E4E has quickly grown into a national network of over 12,000 progressive teachers, united by the E4E Declaration of Teachers’ Principles and Beliefs. The work of E4E and E4E teachers has resulted in modifications to legislation on issues such as layoffs and teacher evaluation, the publication of nationally significant teacher-created policy papers, and national and local media attention highlighting progressive teacher voices. With chapters currently operating in Los Angeles, New York, Connecticut, Chicago, and Minnesota, Educators 4 Excellence is entering an expansion phase as it seeks to provide a platform for teachers across the country to elevate their voices. Grounded in the experience of educators, E4E’s culture revolves around an innovative, entrepreneurial, roll-up-your-sleeves spirit backed by a shared commitment to continuous improvement. For more information, please visit Educators4Excellence.org. This is an exciting opportunity for a mission-driven professional to shape and execute the communication strategy for a high- growth and ever-changing organization that places student achievement first and seeks to elevate the teaching profession. Reporting to one of the Co-Founders and Co-Chief Executive Officers and serving as an E4E National Team member, the Director of Communications will manage the overall organizational communications strategy and design internal communications systems for Educators 4 Excellence. This includes developing an organization-wide branding, messaging, and media strategy to help E4E be seen as a leading conduit of education policy information and ideas; seeking channels so members’ voices can be heard; and training and coaching chapter staff on messaging. The Director will be the organization’s primary brand ambassador, and will build relationships with the media as part of E4E’s overall efforts to advance relationships with current and prospective members and drive broader awareness of the organization. In collaboration with other national team members and external partners, he/she will also oversee the integration and day-to-day maintenance of E4E’s communications. Salary for this position is commensurate with experience. In addition, a comprehensive benefits package is included. Educators 4 Excellence is an equal opportunity employer and welcomes candidates from diverse backgrounds. Needless to say, anyone who can convince themselves that they could place the words “Philosopher’s Camp “ before the words, “education reform”, in the same breath as they are comparing themselves with the likes of Ralph Waldo Emerson, is well nigh in need of a good teacher, a course in philosophy 101, or at the very least, a dictionary. On the other hand the event – which achieves a kind of horrible sublimity in its sheer vulgarity — is perfectly consistent with the tactics of the long stealth campaign to privatize the school system that built America. Of the privatizers many repugnant tactics, none is more consistent, intrinsic or effective than the conscious manipulation of language and images. In this way does a half assed experiment, hatched up in secret by shills and testing companies and financed by a ruthless billionaire, come to be known as the miraculous Common Core State Standards, the answer to all that ails us, the solution to all problems, the alpha and the omega. In this way does the almost biblical struggle for civil rights come to be employed by the privatizers’ public relations department as a tool to strip teachers of the right to due process and undermine unions. In this way does the word “philosophy”, one of the most transcendent and spiritually charged words in any language, come to be used in Lake Placid, as a fig leaf for yet the latest episode in the most rapacious campaign against a vital public trust in American history. Cuomo, coming off orchestrating what is surely the most egregiously unfair education law in the history of New York state, is the “honorary chairman” of the philosophical retreat. It troubles the philosophical Chairman Governor not at all that no educator was invited to Camp Philos, nor even that those who attempted to attend were summarily rejected, one and all. Still, even as I find the privatizers among the most cynical, ignorant and narcissistic people on the face of the earth, I must admit there is one place in which I agree with them, even as I radically disagree with their methods and ends and even as they would disagree with me till the end of time. Like the “reformers “, if for radically diffent reasons, I too agree that the public school system as it has been operating for decades has, in some essential ways, failed America. Further, I would state unambiguously that this failure is generational and so long standing as to be invisible. What, as a society, do we value ? What kind of a people are we ? What do we really believe in ? Do we live our beliefs ? What kind of citizens do we wish to produce ? What, if anything, are our responsibilities to each other ? How are we to live together ? In America we have reduced education to job training. Were it within my power to do so, I would immediately and unapologetically do all I could do to introduce the study of philosophy on some level beginning in the third grade, the age of my daughter as of this writing. And I would make it an essential part of the curriculum in every grade until high school graduation. Implicit with this undertaking would be the understanding that some may not grasp the meaning of the study for years if at all but all would benefit from the exposure as surely as they would exposure to the history of art and music and architecture. Children would begin with a study of the word: “philo,” which means “love. “Sophia,” which means “wisdom.” Let them spend a week, a month, a year — whatever it takes – discussing and attempting to grasp those two words alone and the concept of those together, and you cannot help but have a child with an imagination larger because it is more unleashed than before. Help a child understand that this thing called “wisdom” exists and is real and has been honored and revered by the civilized since the beginning of civilization, that it has nothing to do with the accumulation of material wealth, nothing to do with gaining power over others, nothing to do with competition or control, and you have opened the portals of that child’s mind. And you have done something else: you have given a child a way of seeing that affords he or she some mode of mental protection against a corporate assault that, for many, begins at the moment of consciousness. Worse, the assault is designed to wed that struggling to be formed identity with a product, now and forevermore. ( what ever those weasel words actually mean), it might help them to understand this mystery called Life in all of its paradoxical, tragic and wonderous nature. It is the epitome of critical thinking. We now live in a nation where most citizens seem to believe that the word “philosophy” is synonymous with “opinion.” We have all heard vulgar examples in statements such as, “My philosophy is to hit guy before he hits you”, or some such foolishness. It is, I would argue, the absence of philosophical knowledge that has contributed to much of America’s horrible and dangerous confusion of technology with science, data with knowledge and knowledge with wisdom. Most of all it has led to the savage idea that knowedge is power rather than liberation from the need for power. This is worse than sad. No decent society, never mind an alleged democracy, can exist in this kind of mass confusion. And, yes, many of these same people are products of the public school system and yes, that school system failed them. And it continues to fail them. But rest assured: it will fail them that much further under a system dominated by the likes of the privatizers. When I have asked my students why they go to school and why they study, overwhelmingly they reply with some variation of “ to do well on the test.” This is sick but it is hardly an accident. But why should they think differently? We are now in the process of incubating our children with this shrunken head madness. It is, indeed, a kind of crime: the crime of starving the imaginations of millions of children by sheer neglect. And it is a crime that the miraculous Common Core will not only not correct but will, in fact, perpetuate. I do not believe in magical thinking. (I leave that for the proponents of the Common Core.) I am well aware that the study of philosophy will not automatically and magically make thing better for all. Pre-Nazi Germany had the most rigorous school curriculum in the Western world but it did little to stop millions from embracing Hitler. Something more is needed. 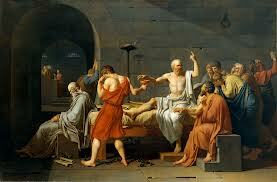 That said, I know this: the absence of something as immense as philosophy can only diminish this nation. As I see it, the problem is ecological. By this I mean if you deprive a child of philosophical awareness you do not get child minus philosophy. You get someone radically different and radically weaker. You get a person whose imagination, the key to all, has been severely diminished. The purpose of education is not to be found in the vulgar slogan, “knowledge is power. ” Indeed, the absence of philosophy is one reason why that slogan is so readily swallowed in our increasingly competitive, miserable, punitive land and is in the very name of the KIPP charter empire. Philosophers and artists and spiritual geniuses have known for thousands of years that education is many things but above all, it is the emancipation of the human imagination: the purpose of education is freedom. As I write, Governor Andrew Cuomo, Joe Williams, executive director of Education Reform Now, Senator Mary Landrieu, film maker M. Night Shyamalan and other non-educators are ensconced in the bucolic bosom of Whiteface Lodge in Lake Placid, New York, making a mock of the language that they use, discussing the creation of conditions that mock the very idea of freedom and positing efficacy, compliance, control and profit above all things. They are mocking, that is, the very essence of philosophy. This they do in the name of education. This they do in the name of children. This they do under the aegis of philosophy. “All that is now proved was once only imagined”, wrote William Blake. I revere Blake as much as any soul who has ever walked this earth but, considering the combination of unimaginable fortunes wed to political power that is determined not only to privatize education but to use the educational system as THE vehicle to permanantly forge the character of America into a corporate fiefdom, it is at this moment very, very hard to imagine a happy ending to this horrific story. And yet, as souls like Blake and Kant and Hegel and Camus and Arendt knew, our imaginations are the only faculties that can possibly sustain us, as they are the only ones that ever have. We must honor our lives and our language, and by doing so outlast the bastards and expose them for what they are. Addendum: I’ve just found out that Andrew Cuomo, apparently at the last minute and doubtless to the great disappointment of his hosts, decided it was a better idea to philosophize with his fellow philosophers via video screen. Hmmmmmm. I’m guessing Cuomo got the willies from reports of hundreds of teachers and parents so filled with disgust with the man that they were willing to brave the rain to make sure he got their message, loud and clear. Cuomo may have been frightened of a repeat of what happened when he showed up recently on Long Island, as reported with relish on Perdido Street School. Good. It’s about time this treacherous invertebrate started to get his comeuppance.